How can Calgary Laserworks & Reflexology help improve your health? You’ve heard the expression, “If you don’t have your health you have nothing.” Take it from those who are bedridden or restricted to a wheelchair because of their health, that this statement is true. Studies have shown that stress has a huge effect on your health. Stress and worry can lead to immune system breakdown and heart-related issues. Smoking is another big factor in the state of your health. It causes lung disease, cancer, emphysema and coronary breakdown. Studies also show that being grateful and happy can reduce stress. It is known that 50% of our inclination to be happy is genetic, something you can’t affect very much, 10% is based on surroundings (job, money and family), and 40% is “deliberate action”. Deliberate actions are things we can control through behaviour. We asked the question, how can Calgary Laserworks and Reflexology help with your health? It can help you stop smoking, reduce stress, help you relax, improve your immune system and much, much more. 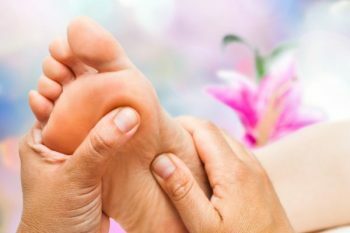 Consider a Reflexology appointment as a relaxing time-out that you deserve. Call 403-301-3730 to arrange your appointment today. You’ll be happy to be improving your overall wellness and empowered to live a full, active life!